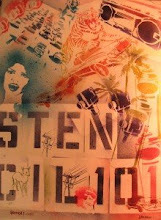 This is a chipboard tag, sprayed with the Memories Mists and chalk inks. The flourish is done with Dreamweaver stencil paste. 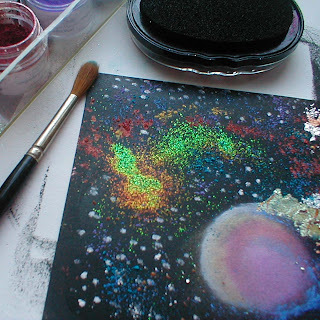 I am going to cover the white with the Gluepad and Gold metal leafing..that is the plan for now.. 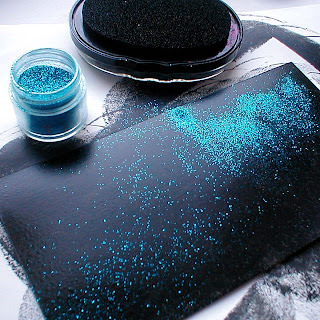 I've also been playing with the black Gluepad some more..here are a few pics illustrating the "painting with powders" I love to do.. Here I'm going for Space..the Decorative Frontier.. This is a piece of chipboard covered with the black Gluepad and heated till tacky.. 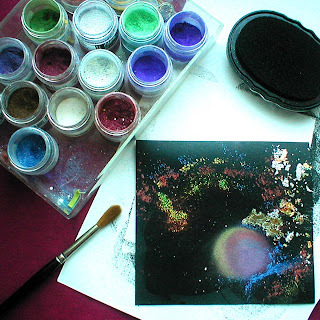 Here I have added pieces of metal leafing, and drops of metallic accent powders..
A close up of the powders, glitters and leafing..I've swirled some of the powders to resemble a planet.. 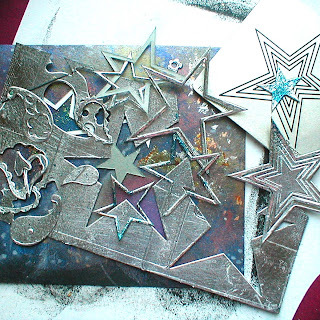 Here are some silver metal stars I've punched out of chipboard, using a diecut machine..too much fun..the silver chipboard was made with the gluepad and silver metal leafing.. 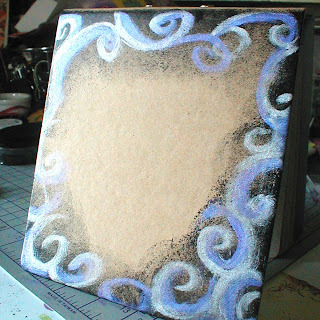 This is the front of a chipboard journal..black Gluepad and some metallic powders.. Check back to see how this one turns out!